Victoria Wilmotte and Giorgio Angeli, despite their different ages and backgrounds, understood each other perfectly when it came time to work together. Wilmotte, a French designer, is an enfant prodige, opening her Paris studio when she was only 24 years old. Today, a decade later, she also has a workshop that produces limited series and prototypes for large-scale production. “It is the first time that I start from a massive block of marble, cut in one signle piece”, she says. She was guided by Giorgio Angeli, who – drawing on 50 years of experience, including numerous collaborations with artists, architects and designers – deftly translated her ideas into two highly elegant pieces. “This work emerged from some experimenting I had done with steel,” says Wilmotte. 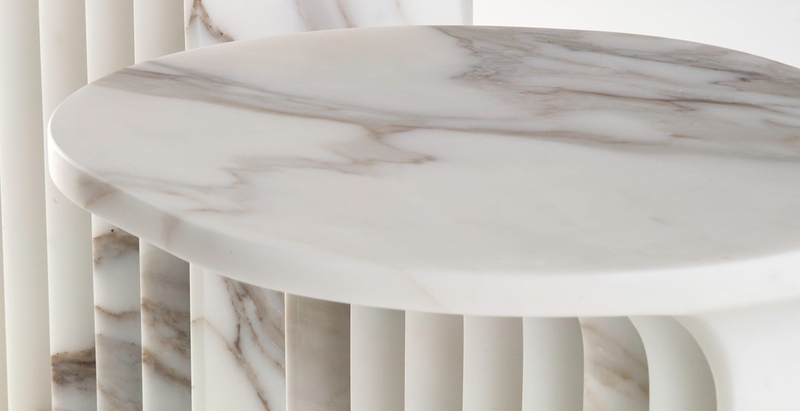 “The sense of flow, created by a six-axis robot, becomes a geometrical motif in the arc that connects the base of the table to the top. And the vitality and fluidity of these shapes are enhanced by the marble’s natural veining. The extreme precision with which Giorgio crafted the two tables was for me a masterful display of passion and skill.” With their creative play on filled and empty space, the Tavoli Angeli – named in honour of the expert craftsman who made them – fit neatly into Wilmotte’s evolving career. In recent years, she has focused on bringing her unique perspective to home décor using what are now her preferred materials, stone and steel, which she explores with the methodical and meticulous fascination of a sculptor.